Denial-of-Service is now for sale! QB1 Roethlisberger, QB2 Fitzpatrick, WR's Johnson & Jennings, RB's Hillis & McCoy, TE Davis, and Pit's D. Solid team with a healthy and bright future, (RB Bush ready for next week, and much more.) Number two in total points, with more than 1k going in to week 10. Over 5 moves left. This team is ready to play hard, and set for a big play-off run. Don't miss this rare opportunity. 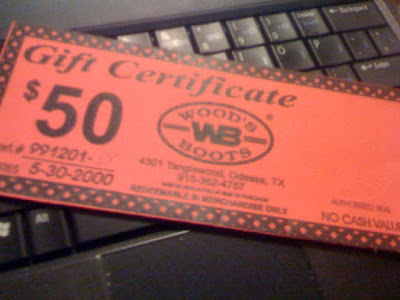 Bibbing starts at an all time low of $50. Start your own Denial-of-Service attack today! The other day I was talking about making my own coffee pods for my Senseo, and Jon said, "You should blog about that." I'm not sure if he thought it would be a good idea, or if it was his polite way of saying, "Leave me alone. If you write about it, it would be less annoying and easier to ignore." Either way, here I am. The only problem is, I learned how to do it from a blog. So I didn't want to just rewrite someone else's words. How about a video showing just how easy it really is. Not just a video, a duel camera video. That would be a challenge, so that's what I decided to do. Here's how I set the whole thing up. 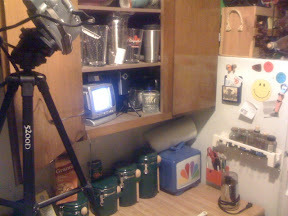 The main camera (a Canon ZR850) would shoot down at my kitchen counter. Two legs of the tripod set in the sink with the third on a TV tray. 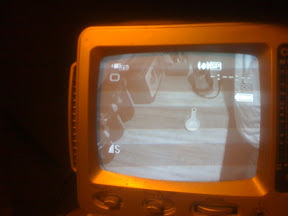 This camera fed a small black and white monitor in my cabinet, so I could see what I was doing. 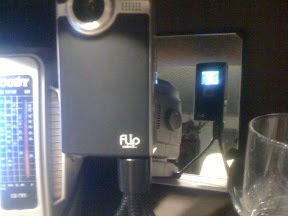 Next to the monitor, I put my Flip video camera. And so I could see what it was shooting, I put a mirror behind it. This is also the camera that captured my audio. 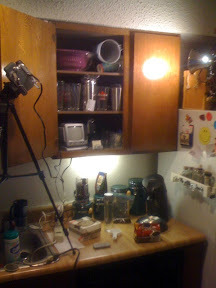 For lighting I just the kitchen lights (CFL bulbs,) an incandescent shop light reflected off the cabinet door to soften the shadows on my face, and I mounted a small fluorescent tube light under the cabinet to help with shadows in the work area. I set my iPhone in a Mini DV tape case next to the Flip to keep time. Now the setup sounds all well and good, here's where I take a left on What! street. To show how easy it is to make the coffee pods, I would do it first thing in the morning. No showering, no brushing the hair, no changing out of the PJ's. Just out of bed and shoot a video. 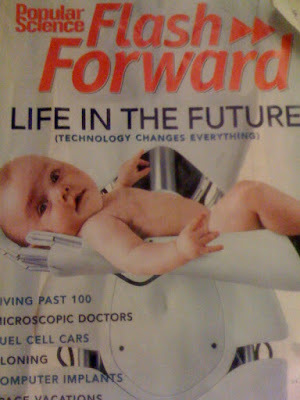 Where's how it turned out. Editing was super easy. I used Adobe Premiere Pro, synced the two videos and cut out a lot of my morning head. Remember, if you're gonna consume internet, you gotta feed internet. Go create.